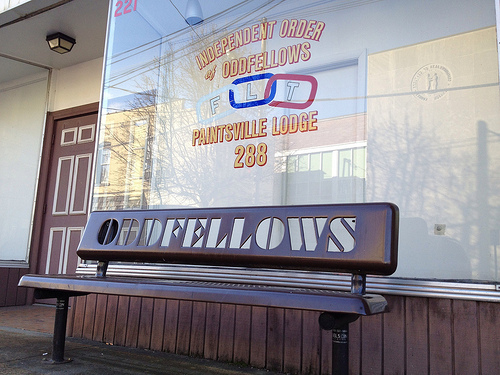 Lodge #288 of the Independent Order of Odd Fellows - Paintsville, Ky. Following the Civil War and until FDR's New Deal, the Independent Order of Odd Fellows grew in numbers during an era known as the "Golden Age of Fraternalism." Over time, however, these numbers withered away. Today, Freemasonry is the best known of the active, classic fraternal orders, but the Odd Fellows were at one time, the largest fraternity in the world. The organization is based on the three principles of Friendship, Love and Truth symbolized always by three interlocking rings. This symbol is visible on the headstones of deceased Odd Fellows and on the IOOF lodges. Across America, beautiful lodges were constructed in large cities and small towns alike during the heyday of IOOF fraternalism. We've already profiled the beautiful lodge in Lexington that was designed by Cincinnatus Shryock - a lodge that closed many years ago. And though the presence of the Odd Fellow has waned from central Kentucky, it remains present in a few pockets of the Commonwealth. According to the IOOF.org website, only five lodges remain active in the Commonwealth fulfilling the mission of the organization. These five lodges are, in addition to the pictured Paintsville lodge, located in Frankfort, Madisonville, Inez, and Bowling Green. (An internet search also reveals an active lodge in Pikeville.) The Odd Fellow's traditional mission is to "visit the sick, relieve the distressed, bury the dead, and educate the orphan," though the organization's role in the community has shifted over the years as needs vary. I AM AN ODD FELLOW: I believe in the Fatherhood of God, and the Brotherhood of man. I believe in Friendship, Love and Truth as basic guides to the ultimate destiny of all mankind.I believe my home, my church or temple, my lodge, and my community deserve my best work, my modest pride, my earnest faith, and my deepest loyalty, as I perform my duty "to visit the sick, relieve the distressed, bury the dead and educate the orphan" and as I work with others to build a better world, because, in spirit and in truth, I am and must always be, grateful to my Creator, faithful to my country and fraternal to my fellow-man; I AM AN ODD FELLOW! Of the Paintsville Lodge specifically, I can find little information, though genealogical records online do record attorneys, the local postmaster, and local businessmen as members. As for the present, the bench bearing the "Odd Fellows" name - immediately across from the old Johnson County Courthouse - caught my eye because I recognized just how much rarer today is the Odd Fellow.